We store our white wine in the cooling confines of none other than an old refrigerator that quietly hums in the solitude of our garage. How do you store your white wine? On the bottom shelves of my Vinotemp. That does not keep cool enough to drink right out of the Vinotemp so I then shift a few bottles to my refrigerator. Those are the whites I usually plan to drink within a week or so. We store it in the basement with everything else. We chill it in the fridge before serving. We can have white wines for years because I don't really prefer them. Usually, we only have them for company but I'm getting better with trying them. I'm with you Rachel, our whites don't move very quickly. Especially since my wife doesn't like many of 'em, I usually just save them for when I am drinking alone and want something cold. 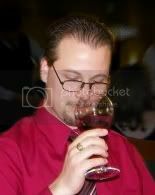 Richard, have you ever tried one of those wine chillers that cool the wine down as you pour through it? What do you think? Are those things a waste? I have not tried them yet so don't know how well they work or not. I don't recall any of my friends who have tried it either. Anyone else out there try one of these things?